Not too long ago I was in the same shoes you’re in now. I simply didn’t have the room, or the know-how at the time to do anymore with what space I had. But, I knew I had to do something fast to change my situation. It seemed every time I turned on the TV or opened a newspaper I was bombarded by breaking news about what my family was eating…with each report worse then the last. I was so overwhelmed with it all that I started to see the news tickers and headlines scroll past my vision as I slept each night. Was There No Escaping This Cycle? I needed to find an inexpensive way to turn what little resources, and time, I had into a system that could not only keep my family feed and free of modified foods, but also do it in as small a space as possible. I started doing some research…a lot of research in fact. I interviewed the folks at the local Co-ops, efficiency experts, gardening supply stores, and even my neighbors about different gardening methods that could suit my family’s consumption requirements. Not to mention, fill the all-important demands I required as a preparedness expert. In short – I found the answers I had been so urgently seeking. Instead of sprawling out on the ground, I discovered how to sprawl “up” and increase my growing space at least tenfold – probably more. Now admittedly, I can’t take full credit for this – its not rocket science after all – but what I’ve done is take my YEARS of research and THOUSANDS of dollars of trial and error and simplify the concept. In truth I turned a “good idea” into a life altering – chemically and genetically manipulated free – system. How much is your time worth? How much is your life worth? How much is your health worth? Think about it. Why should you go out and duplicate all this information on your own? Why should you have to waste your hard earned money on systems that will fail you? I did the hard work, and all the trial and error has already been done for you. Everything you need to know to get started today is in this no fluff 59 page guide to Family Survival Gardening that will keep your family happy, healthy and feed for years to come. There’s no need for you to go through what I did. Long interviews with as many people as I could find, even longer sleepless nights of research, and countless mistakes from trials in the field. You see, I’ve already done the work for you. All you have to do is take me up on this once in a lifetime offer! If you read the paper and watch the news, then you’ve seen for yourself that you never know when or where a crisis will hit and disrupt the delicate balance of your life. Furthermore, you’re the only one who can provide long term, fresh and healthy fruits and vegetables for your loved ones. How do you think they would feel if you waited…or worse – did nothing and let this book slip through your fingers? If they ever found out you could’ve had a bounty of fresh produce to keep them all healthy, energized, and satiated but didn’t – well…I don’t think I’d want to be in your shoes at that time. I’m not saying that to make you feel bad – I’m only telling you the truth that you already know. But you can avoid all that by simply grabbing your copy of the Expert Prepper’s Family Survival Garden. Yes, access to my Family Survival Garden guide is only 7 Bucks, which I think you’d agree, is an extremely reasonable price to pay for the security and health of your family. Trust me, friend – it will be a decision you will NEVER regret. If for any reason you are not 100% satisfied with Expert Prepper’s Family Survival Garden, I will refund 100% of your purchase price… No Questions Asked. You have a FULL 60 DAYS to decide. You will receive a Complete 100% Refund for the full purchase price. No questions asked, just send me an email (support@expertprepper.com) and we’ll get your refund to you right away. If you are not 100% satisfied with your purchase let me know. I don’t care about the reason, this is a “no questions asked” policy after all. I will issue the refund immediately. Take the full 60 days to decide! Read over the materials, follow the instructions and take in the concepts. I want you to make sure this guide is worth every penny you paid. If not, then you can get a 100% refund, no questions asked. So don’t delay. Act now and start growing all the food you’ll ever need to feed your family…and you can have it up and running in just a few short hours from now! Yes Skip I Want It! 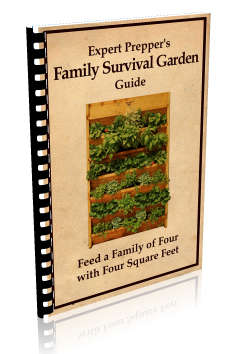 I want my risk-free access to the Expert Prepper’s Family Survival Garden guide so I can start growing safe and healthy food for my family today… before it’s too late. Give me instant online access to the report now. I understand that my order is backed by your 100% -no questions- asked money back guarantee for a FULL 60-Days. If I’m not happy with my order, for any reason, I have nothing to lose because I get every penny back. I understand that I will be able to start growing GMO Free foods from my home…even if I don’t have a yard… starting in less then 24 hours. I also understand that Skip is offering this to me at the extremely reasonable price of only $7.00. Here’s what you do to order… Click the Add To Cart Button below, fill out the information on the next page, click Pay Now and download your online copy. That’s it! 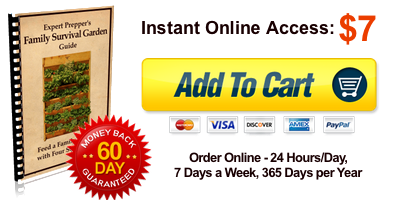 Remember your purchase is backed by our Iron Clad 100% Money Back Guarantee. If for any reason – or none at all – you’re not 100% satisfied with the information here just drop me an email and I will refund every penny…no questions asked. Think about it – do you have enough space in YOUR back yard to cultivate a sustainable garden of precious fruits and vegetables? Even if you do – are you able to keep charlatans looking to steal the food out of your family’s mouths from raiding your garden? You need to take action now…do this for yourself and your family. You’ll be amazed at how fun it is and better still – easy to control and maintain. I’ve dropped the solution you’ve needed (but may have not even known it) into your lap…what you do with it is now up to you. Avoid the mistake of those before you – claim your copy of the Expert Prepper’s Family Survival Garden guide today.